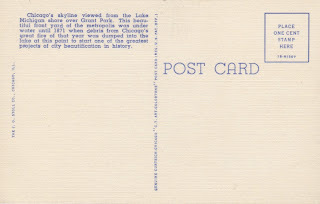 Another old postcard that had never been sent. 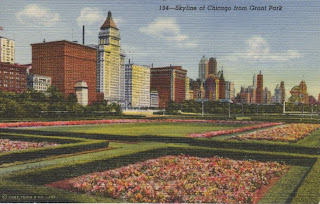 Hmm, just how much has the Chicago skyline changed since this was printed? Probably more than a little bit. Only one cent postage is required, so it's pre-1952. "Chicago's skyline viewed from the Lake Michigan Shore over Grant Park. This beautiful front yard of the metropolis was under water until 1871 when debris from Chicago's great fire of that year was dumped into the lake at this point to start one of the greatest projects in beautifucation in history."